Minorikawa Nobuhide, the Japanese Parliamentary Vice-Minister for Foreign Affairs, is shown the tanks used for frog breeding. 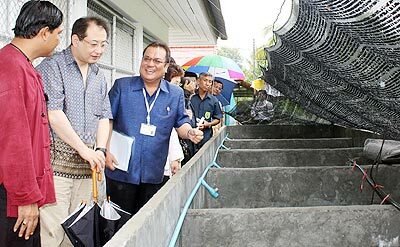 Minorikawa Nobuhide , the Japanese Parliamentary Vice-Minister for Foreign Affairs recently paid a visit to the Environmentally Protective Organic Farming Promotion Centre located in Doi Saket district’s Tambon Choengdoi. Previously, the Japanese government’s Grant Assistance for Grassroots Human Security Project had given a grant to the facility of 1.5 million baht, enabling the centre to erect the necessary buildings. Prior to the founding and opening of the centre, local farmers had been using chemical fertilisers, herbicides and pesticides, with amounts used increasing every year in order to achieve results. Farming expenses also increased in line with the cost of chemicals, as did the concern of farmers about the environment and the safety of their crops. Many farmers were experiencing declining health and skin conditions as a result of the over-usage of dangerous chemicals. Since then, local farmers have become aware of the advantages of organic farming, which has lead to the recovery of the precious soil and an improvement in their health. Sustainable agricultural practices are now being promoted, with many farmers from outside the immediate area now coming to the centre to learn about the theory and practice of organic farming methods. During his visit, the Japanese Minister and his government delegates also made plans for a project to organize a joint educating and training programme involving Japanese and Thai housewives and farmers in Doi Saket, to enable them to share knowledge and experiences on both Thai and Japanese agriculture. Christina & Malcolm donate 100,000 baht to Dr. Therdchai. Our initial plans for our first trip to the Prosthesis Foundation in Chiang Mai was cancelled as Suvarnabhumi airport was somewhat OCCUPIED! So, with the approach of Songkran, we thought it would be a good time to disappear. We flew in on the Friday - the Foundation had agreed to pick us up 9.30 a.m. on the Saturday. Start of a new limb. On our arrival, we met with Dr. Therdchai Jivacate, the Secretary General and founder of the Prostheses Foundation, set up when the Princess Mother learned that Dr. Therdchai had devised a process to make artificial legs from recycled plastic and recycled aluminium which were lighter, more comfortable and 10 times less expensive than imported ones! As well as our cash donation of 100,000 baht, we went armed with thousands of ring pulls from cans of soft drinks and beer, which will be melted down and used. After meeting with Dr. Therdchai, and donating our funds, this great man took us on a tour of the Foundation. First stop was the accommodation they provide for people who come for training and rooms for the disabled who are from outside Chiang Mai. Then we went to the main area where the limbs are made and were shown the many different types of prostheses available. We didn’t want to intrude too much on the people who were being treated so we chose to see just two patients. In the Physio department, one, a young lady, was being measured for her new limb after losing her leg to cancer; the second, an older man, was learning to walk, wearing his new limb, and was adapting very well. After coffee and cake, the tour centred on the factory. We were shown the process from the start; the measuring of the patient, the materials used, the machines that make the limbs, test the limbs and finally how the adjustments to the limbs are managed. During his research, Dr. Therdchai found that a lot of the patients brought to his attention were poor farmers who live in rural areas and have no money to travel to Chiang Mai to receive services from the Foundation. His immediate solution was to get a team together and actually go out into the rural provinces around Thailand. As a result, residents in several far–flung villages were trained in the art of making limbs, and provided with small workshops and materials for the new assistants to use in those areas. The Foundation also has a mobile unit, which, along with Dr. Therdchai himself, visits rural areas for 5 days at a time, and has now made trips to 52 provinces in Thailand as well as to Malaysia, Laos and Myanmar. The unit has provided service to 14,130 patients, made 17,251 new prosthetic legs and repaired 2,336 legs. An amazing record! Touched and heartened by what we had seen, we decided there and then that a good project for one of our upcoming Charity Events would be to try to raise funds for a second mobile unit. Dr. Therdchai has also adapted a prosthesis especially for farmers, so that the poor farmers can go back to work using this very sturdy leg - even in muddy rice fields. The cost per unit is ONLY between 500 -1,000 baht. We were also shown the prosthesis that Dr. Therdchai has made for Mosha - the cutest baby elephant that had the lower half of her foot blown off by a land mine while walking with her mother on the Thai/Burmese border. The Foundation also makes artificial limbs for dogs! Recently, the Foundation has introduced a simple but highly efficient manufacturing technique, sand casting. With this technique, the Foundation can make a good prosthetic leg for below the knee amputees within 4 hours, instead of 8 hours. While we were at the Foundation, we showed Dr Therdchai several photos of adults and children who are in desperate need of artificial limbs. We are happy to report that he agreed to examine 11yr old Surapon and 25-year-old An, when the mobile unit visits Isaan in September. Christina and her husband Malcolm are a powerhouse of compassion, energy and commitment to helping the poverty-stricken, the disabled and the needy. In the 5 years since they founded their small charity club, they have raised an incredible 3,353,000 baht, —all of which has been spent helping those in need. Liam’s Suan Dok Mai Guesthouse and Belgian Home Cooking. Located off Faham Road in the Samakan Village Moo Baan, Liam’s place is clean, new, and attractive and features a large garden with swimming pool as well as two stories of modern guest rooms. The ground floor rooms feature a small back yard so guests who are travelling with (pre-approved) pets will have a comfortable place to stay. A note to animal lovers – and others – there are several very friendly and well-behaved canines who live here, and who will drop in to say hello. The menu at Liam’s is extensive, with a large selection of salads, soups and sandwiches, including a variety of “croque monsieur’s” toasted bread with ham and cheese in various combinations. But the real hit of the menu – and its surprise – are the genuine Belgian main dishes, including Belgian beef stew with Belgian brown beer sauce, for 175 baht, or pork stew with red peppers, onion, carrot and green peas for 165 baht. On a recent visit, our party tried several different entrees and pronounced them all delicious. Included was Lamb Winterstew, a generous serving of very tender lamb with potatoes, carrot, leeks, celery, horseradish, white cabbage, onion & garlic for 195 baht, as well as Pork Winterstew, with the same mixture of spices and vegetables at 165 baht; and a generous, no, make that huge, Salade Niçoise, with lettuce, mixed vegetables, onion, tuna, anchovies and black olives for 165 baht. One diner opted for the special Greek-style lamb meatballs in tomato sauce, accompanied by fresh pita bread and a Greek salad with lots of feta cheese. This was the most expensive item at 295 baht, but no complaints were heard. There is one dish many of us think of when we hear the word “Belgian,” and that’s waffles! For the utmost in decadent desserts, nothing beats a freshly-made Belgian waffle topped with whipped cream, ice cream, fruit, and melted Belgian chocolate sauce. At 85 baht plus 20 baht for the ice cream, it was a hit. But the confirmed chocoholic with us couldn’t resist Belgian Chocolate Delight, consisting of 3 scoops of chocolate ice cream, whipped cream and hot Belgian chocolate for 75 baht. Oh my. Lots of “mmm’s” and “aah’s” pronounced this the perfect ending to a surprising and delicious meal. For more information, check out the website at: www. liamsuandokmai.com.